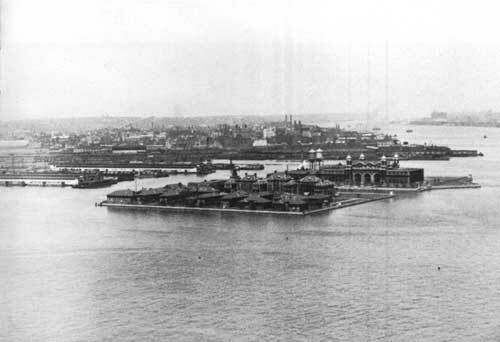 Views from Bedloe's Island; New Jersey shore line (above); Ellis Island (below). THE MONUMENT is open daily to visitors, Sundays and holidays included, from 9 a. m. to 5 p. m. When daylight saving time is in effect, the monument is open from 9 a. m. to 6 p. m.
Souvenirs, post cards, and a lunch bar are provided for the public through the facilities of a private concessioner. Postal and telephone facilities are also available. "Seatwalls" are provided on the grounds and benches on the promenade of the statue. Monument personnel are on duty and will be glad to answer any questions. There are a number of interpretive facilities in the lobby of the administration building, as well as historical and interpretive markers along the Statue pedestal passageway beyond the elevator shaft. Additional historical and interpretive markers are on the fourth level at the top of the elevator shaft. Outside, along the railings of the overlook, a series of sketch drawings depicts in silhouette the scene directly in front of the viewer. The drawings identify various features and buildings of New York Harbor and the sky line. By the use of these sketch drawings, one may identify practically all the points of interest seen from the four sides of the overlook, with its magnificent panoramic view of New York Harbor, Manhattan Island, Staten Island, and the New Jersey waterfront. Free literature relating to the monument may be obtained by visitors. 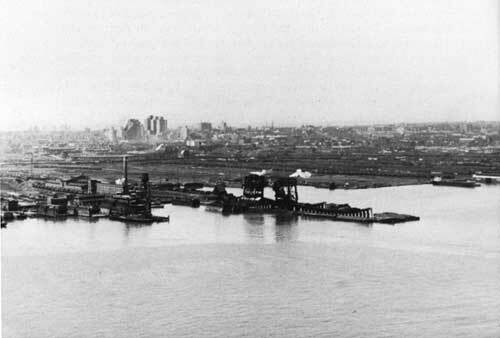 Various sales publications relating to the history of Bedloe's Island, the Statue of Liberty, and New York Harbor are also available. STATUE OF LIBERTY National Monument, compared with other areas in the National Park System, is unique in its symbolism. Although its conception was a direct result of the Franco-American Alliance during the American Revolution, it does not, like other areas, commemorate an event or a particular person. Those areas included in the National Park System which do commemorate phases of the American Revolution are: Saratoga National Historical Park, N. Y ; Morristown National Historical Park, N. J. ; Independence National Historical Park Project, Pa.; Colonial National Historical Park, Va. ; Moores Creek National Military Park, N. C. ; Guilford Courthouse National Military Park, N. C.; Kings Mountain National Military Park, S. C. ; and Cowpens National Battle field Site, S. C.
Two other areas, administered by the National Park Service, both in New York City, are not far from Statue of Liberty National Monument Federal Hall Memorial National Historic Site, located at Wall and Nassau Streets, and Castle Clinton National Monument, at the tip of Battery Park.